I love the macadamia and white chocolate combo in any cookie. But with added cranberry I wasn’t sure how I would like it. Would it ruin my favorite kind of cookie? I couldn’t wait to give these a try! The cookie base itself is perfection. It is perfectly chewy. And surprisingly enough, I LOVED the cranberry! It wasn’t overpowering but gave the cookie enough cranberry flavor. My first bite was so amazing. The cookie was still warm and the chocolate was still melty. I had four! UGH. Why did these cookies have to be so incredible? All I want is another. These cookies are perfect for the holidays and you have got to give them a try! 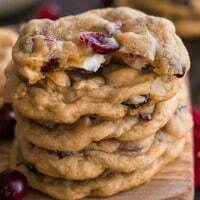 Perfectly chewy cookies packed with white chocolate, cranberries, and macadamia nuts! Sift the flour, baking soda and salt together in a medium mixing bowl. Set aside. Preheat oven to 350 degrees. Cream together white sugar, brown sugar and softened butter. Add eggs and vanilla. Add flour mixture until just mixed. 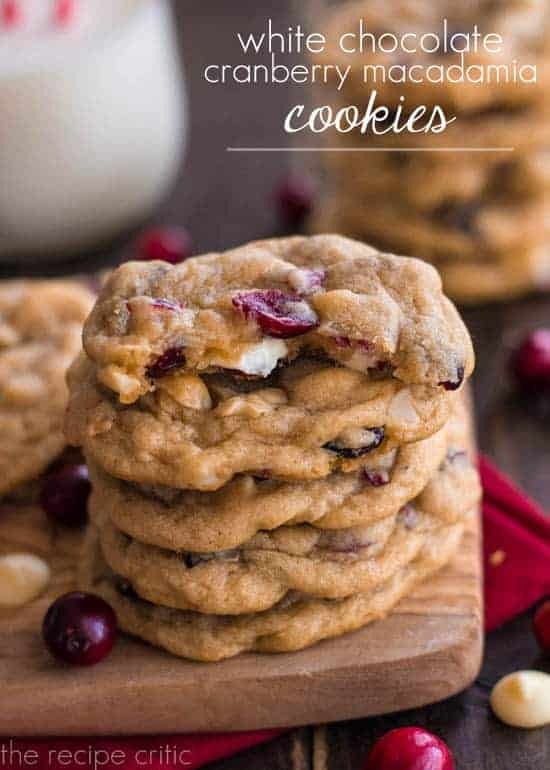 Stir in dried cranberries, white chocolate chips, and macadamia nuts. Drop cookies by rounded tablespoons on an ungreased baking sheet. Bake for 10-12 minutes or until just set. Allow to cool and transfer to a wire rack. Cranberry and white chocolate are such a perfect combination! Alyssa, I love baking these drop cookies this time of year. I usually add toasted pecans, but I love that you added Mac nuts! Beautiful styling and photography, too. Thank you for sharing, girl. Pinning! These cookies look incredible Alyssa! It would definitely be very hard to eat just one of these – love cranberry, macadamia and white chocolate together! can you use fresh cranberries instead of the dried? Best new cookie recipe that I’ve made in a long time. Everyone fell in love with these. Making another batch today. 🙂 Thank you for sharing. Best new cookie recipe that I’ve made in a long time. Everyone loved these. Making another batch today. Thanks for sharing! LOVE WHITE CHOCOLATE & CRANBERRIES. THESE SOUND SO YUMMY, WILL BE MY CHRISTMAS COOKIES. I started making these cookies and realized I only had one stick (half a cup) of butter. I also left out the craisins because my husband is not a fan of them. They were a hit! He loved them. Thank you for the recipe! I followed this recipe exactly as written. They did not turn out like the photo. The cookies turned out rounded and did not flatten. I had to bake them over 20 minutes. I also thought they were too sweet. Do you think that step 4 may need to be changed to drop by rounded teaspoon?